Our neighbor, Liz, reached out to us recently to tell us about team member Michael, who was so helpful to her in choosing the right food for her cat. Sadly, Michael passed away suddenly, just a few weeks after she had this pleasant encounter. 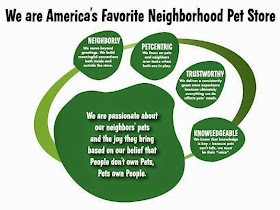 We'd like to take a moment to remember this, and all the wonderful neighborly, trustworthy, pet-centric and knowledgeable service Michael provided here at Pet Supplies Plus. He is very missed by his team and all the neighbors who enjoyed his expertise, great attitude and infectious smile. I would like to recognize an employee for his help and kindness. His name is Michael. He used to work at the Manchester Rd., Coventry, Ohio store and was transferred to the Arlington Ridge Rd., Akron, Ohio store. He is now a shift supervisor. Michael always helps me find what ever I am looking for or checks to see if something is in stock, if not on the shelves. He also helped me choose a healthy dry food for my cat. He explained some differences in natural hard foods and let me know my cat would eat less of the new food, as it would be more filling. He took time to explain how to start taking the old food away. He is always pleasant, clean cut and smiles. The people at Pet Supply Plus are always courteous and helpful. Sorry for the loss of an exceptional young man.